Dr. Guerrero’s innovations in using statistics and visualizations prompted numerous data-driven policy decisions, including time restrictions on the sale of alcohol, gun bans on holidays and selected weekends, and conflict resolution campaigns that were broadcast in neighborhoods citywide. In addition to new policies, Cali’s police force has adopted Dr. Guerrero’s methods, making it mandatory to measure and report daily metrics for crime within city limits. Regular Security Council meetings with government officials are now held to benchmark progress on a variety of statistics and actively set new goals. 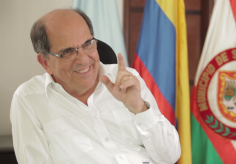 Dr. Guerrero’s innovations also inspired the development of the independent research institute Cisalva, which collects and standardizes homicide data for more than 15 countries throughout much of Latin America. Now, nearly two decades later, Cali’s homicide rates have declined from more than 100 per 100,000 to approximately 60 per 100,000 in 2014, a record low. Behind this success is Dr. Guerrero’s strong application of the scientific method: evaluating results, taking action, and repeating the cycle. 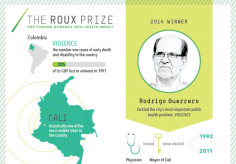 Since receiving the inaugural Roux Prize, Dr. Guerrero has drawn much attention from the media, both domestic and international, as well as government officials from other cities and countries. He recently consulted with the government of Honduras, a country with historically high violence rates, on how to reduce violence there. With homicide and violence on the decline in Cali, Dr. Guerrero is now in his second term as mayor and finds himself returning to the scientific method, defining new problems, and determining the attributable risk factors. Now, his strategies for reducing homicides focus on social investment and other preventive measures. He believes continued progress is not just about enforcing laws and monitoring criminal or aggressive behavior; the city must also invest in community programs that prevent violence from reappearing. One program that has already proven successful is Territories of Inclusion and Opportunities (TIOS), in which his administration designates officials to work within specified districts to hear public concerns and address issues relevant to their communities. TIOS helps drive programs, including organized sports activities, job training, and family counseling, to provide young adults and other community members with opportunities that keep them away from dangerous activities and behaviors that later lead to spikes in violence. This improved pathway for community voice has also allowed the administration to make financial and social investments to improve the specific needs of individual communities. Examples range from providing enough chairs and desks for students in school classrooms, to installing more lights in public areas and parks to reduce criminal activity at night. 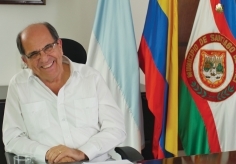 Rodrigo Guerrero used data to improve the health of the residents of Cali, Colombia. What problem will the 2015 Roux Prize winner tackle with evidence? Submit your nomination for the 2015 Roux Prize today.